Network Releasing has announced two critically acclaimed documentaries relating to AIDS. 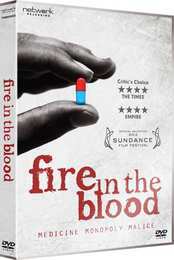 The first of these, Fire in the Blood, arrives on 24th March and is directed by Dylan Mohan Gray. With a runtime of 84 minutes and extras that include a trailer and deleted scenes, this will carry a recommended retail price of £12.99. 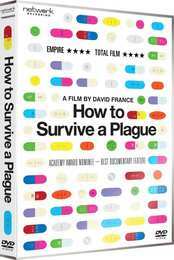 This is a critically-acclaimed documentary of medicine, monopoly and malice that tells the story of how Western pharmaceutical companies and governments aggressively blocked access to low-cost AIDS drugs for the countries of Africa and the global south in the years after 1996. The film investigates how this caused over ten million unnecessary deaths and the improbable group of people who decided to fight back. Shot on four continents, it tells its remarkable story through the eyes of AIDS patients, front-line clinicians, radical health professionals, pharmaceutical company executives and global figures including Bill Clinton, Desmond Tutu and Joseph Stiglitz. It is the never-before-told true story of the remarkable coalition which came together to stop 'the Crime of the Century' and save millions of lives in the process. Following the above on 31st March is How To Survive A Plague, directed by David France. This has a runtime of 110 minutes, and also comes with the RRP of £12.99. This is about how ACT UP and TAG (Treatment Action Group), and how their activism and innovation turned AIDS from a death sentence into a manageable condition. Despite having no scientific training, these self-made activists infiltrated the pharmaceutical industry and helped identify promising new drugs, moving them from experimental trials to patients in record time. With unfettered access to a treasure trove of never-before-seen archival footage from the 1980s and 1990s, filmmaker David France puts the viewer smack in the middle of the controversial actions, the heated meetings, the heartbreaking failures, and the exultant breakthroughs of heroes in the making.